You may use the BACK button to return from any of the links on this page. ACE OF ACES is copyrighted by Alfred Leonardi, all rights reserved. Note: The scanned images for these editions have been lost. They will be replaced as soon as possible. During the preparation of this article, I became aware of a number of foreign Ace of Aces editions. Unfortunately, I have not yet been able to get my hands on these in order to describe them with as much detail as the other editions covered in the Reference Guide. The only foreign sets released used either the Handy Rotary or Handy Rotary Deluxe books. Any assistance in locating these editions would be greatly appreciated. I will prepare an addendum to the Reference Guide once I have located some or all of these foreign editions. Richthofen was the name for the Handy Rotary Deluxe set as released by Emithill Ltd. in England. The components should be similar to those previously described for the Handy Rotary Deluxe Edition in matte box. The main exception would be the rulebook which should be the same as that described in the Richthofen edition above. Figure 29. Gallimard was licensed to produce a Handy Rotary edition in France. If the cover artwork is any indication, this was a first class production. The cover has a colorful depiction of a Fokker Dr. I flying above what appears to be a SPAD XIII. Figure 30. Across the top of the slipcase are the words: "Un jou dont vous etes le Heros une Aventure a Partager: Duel" and the game is titled "Vous etes l'As des As." The game book covers also have color illustrations in the same style as the artwork on the slipcase except that the aircraft depicted are a SPAD and a D series Albatros. Figure 31. The cover of each book shows the opponent's aircraft going down in flames, a nice touch! A Handy Rotary Deluxe set in a slipcase was released in Japan. It was licensed to and published by Softbank. The slipcase cover art is the same as the boxed Deluxe Handy Rotary editions. Figure 32. 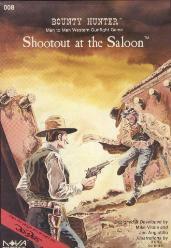 The rulebook and illustrations appear to have been adapted from the Deluxe editions. Figure 33. Dennis Greci believed that a Brazilian version was also released but I have no information about it at this time. What about the unreleased titles in the series? There are at least four planned or announced Ace of Aces games that were never released: Patrol, Ground Target, Ace of Aces: Two Seaters and Wingleader: Bomber. The first two titles are notorious to any Ace of Aces fan as they were trumpeted in the earliest Handy Rotary editions as "SERIES TO COME." The description of Patrol in the original Handy Rotary book states that it will feature "some of the lesser-known planes of WWI." Although it sounds like just another set of expansion books, Dennis Greci of Nova Games related that this was to have been a campaign game in WWI "similar to what the computer WWI air games do now." However, he didn't recall the concept having been put down on paper. Ground Target, as described in the Handy Rotary book, was to allow you to "fly two-seater missions such as bombing and ground surveillance." The series was to be accompanied by a Terrain Book. The intriguing promo goes on to state that a "pilot can chart his course to a target, attack it, photo it, strafe it, bomb it, direct artillery barrages at it or even land in a field next to it." Greci stated that there were some early prototypes of Ground Target floating around but none received serious playtesting and the system was never perfected. Ace of Aces: Two Seaters was a preliminary design to bring WWI aircraft with tail gunners into the Ace of Aces system. Some preliminary playtesting indicated the system would work fine but final development was never done. 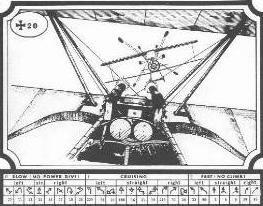 For an idea as to how the system might have worked, refer to the flexible gun for the D.H.2 in the Flying Machines edition. Another interesting concept that is still on the 'drawing board' is Wingleader: Bomber. Greci worked on this one and described it as completely developed and playtested. 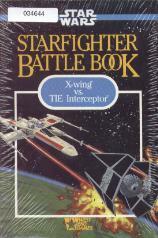 The game would have included a fighter book and a bomber book, scenarios, and an additional 24 aircraft cards. The bomber book featured views that included various gun stations showing when the opposing plane could be fired on. Greci stated that the game worked best when played with two or three fighters against one bomber. Greci said that there was also discussion of a two-seater version of Wingleader. Testing showed the lone two-seater usually died. "Big surprise" noted Greci sarcastically. There are two other phantom names that are related to the Ace of Aces system. Wingleader was originally announced in Space Gamer magazine as two separate sets: Spitfire vs. 109 and Corsair vs. Zero. Following that announcement a decision was made to only release the European Theater books (Wingleader) and to include Pacific Theater aircraft on the data cards. What other games were based on the Ace of Aces system? This unreleased game of combat between sailing ships was based on a variation of the Ace of Aces system. Announced as "Tall Ships" in a Space Gamer magazine preview, Greci refers to it as "Captains & Privateers." The game was playtested and finished but never went to final art production. Greci said the game used "a unique system which forced both ships to use the wind to select their maneuvers. It gave a very realistic feel for why the weather gauge was so important in naval battles of that era. It was designed to cover roughly the same era as Wooden Ships & Iron Men. Maybe someday it'll see the light of day." This variation on the Ace of Aces system used illustrated game books to portray your view as you stalk an adversary in and around a small saloon. Each book featured 290 views and allowed for limited interaction with a few non-player characters. Future expansions for surrounding structures were announced but never released. An interesting extension of the concept with some inherent problems that undermine the play value. 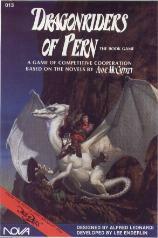 This game of cooperative competition is based on the Anne McCaffrey "Dragonriders of Pern" series of novels. The players must fly their dragons to destroy the falling 'thread' before it hits the ground. The books each have 115 illustrations done by artist Arne Starr who is renowned for his work on the Lost Worlds series. Star Wars uses the standard Ace of Aces 223 view system to portray a space battle between an X-Wing and a Tie Interceptor. Added rules simulate the technology of futuristic space combat. In addition, each ship can perform maneuvers the other cannot. The game books are about twice the size of the original Ace of Aces books. Recommended for Ace of Aces enthusiasts who want a change of pace! A note about the Nova Lost Worlds Fantasy Combat books is in order. Although some believe that Lost Worlds uses "the same" system as Ace of Aces, this is not the case. Other than having superficial similarities in format, the Lost Worlds game system is completely different from Ace of Aces. To find out more about these fantasy combat books, visit www.lostworlds.com. What Ace of Aces related merchandise was there? A 1985 Nova Game Designs mailing I received offers Ace of Aces t-shirts and posters. Figure 34.) The t-shirt was priced at $5.50 and is shown as having the distinctive "Ace of Aces" name above a Fokker Triplane. The $2.00 poster was a 17x22 two-color adaptation of a WWI recruiting poster showing a bald eagle knocking the crown off of an Imperial bird of prey. The text on the poster reads in part: "Official Ace of Aces recruitment center, be a majestic eagle." How scarce are the various Ace of Aces games? I have a general aversion to rarity lists that purport to classify items in nebulous terms such as rare, very rare, extremely rare, etc. However, I have compiled the following list to serve as a rough guide in determining the relative scarcity of the various editions. The list begins with the most difficult to find items and concludes with the most easily found items. I have omitted those items for which I am unable to give a ranking. Primary factors considered in drafting the list were: the difficulty I had in locating the edition, how often I've seen the edition offered for sale in new or used condition, and information regarding how many copies were produced. Which Ace of Aces games are the most desirable? These are what I consider to be the most desirable editions of Ace of Aces. These items are listed in no particular order and are what I would consider to be the "essentials" for the Ace of Aces collector and player alike. Although the recent re-release of vintage Nova Lost Worlds reprints by Greysea LLC may have stirred hopes of new Ace of Aces expansions, such a development does not appear to be on the horizon. Both Alfred Leonardi and Dennis Greci agreed that the costs would be prohibitive to release new Ace of Aces games done in the same manner as the original editions. UPDATE: A 20th Anniversary Edition of Ace of Aces has been announced on the Ace of Aces web site! Keep an eye on that site for more details. However, Greci did state that there is always the possibility that some of the expansion materials might be released as a limited edition through Greysea if there was sufficient interest. If you wish to encourage such efforts, please visit the Ace of Aces page at www.aceofaces.com and show your support. In the meantime, I'll see you on page 20! Between all its different editions, Ace of Aces allows you to fight with or against over 100 fighter aircraft. These lists cover all of the different aircraft represented in the various editions of the Ace of Aces series. Each aircraft is followed by an abbreviation indicating which edition(s) the aircraft appeared in. In addition, the World War I games featured special rules for several historical aces. The 32 aces portrayed in the World War I books are listed below along with an abbreviation indicating which edition(s) the pilot appeared in. GamesMaster Catalog (1980) Boynton & Associates, Inc.
Special thanks to Clayton Church of Greysea LLC for his assistance with this project. All company names, game names, publications, logos, artworks and other products referred to herein are copyrighted, trademarked, and/or registered as applicable by their rightful owners. No affiliation with the author is claimed or implied. Use of a trademark to identify a product commented upon in this article should not be construed as implying the sponsorship of the trademark holder nor as a challenge to such status. ACE OF ACES is copyrighted by Alfred Leonardi, all rights reserved. Please e-mail me with any question or comments about this web page at (turn it backwards) ten.onaclov@kcirevameht.